2004 Andrew Denton interviewed Lisa Marie Presley, ABC TV. Lisa Marie, who divorced Jackson in 1996, told Denton she had felt powerless in her marriage, and that was why she left… “I mean, powerless in a lot of ways, in terms of … realising that I was part of a machine, and seeing things going on that I couldn’t do anything about,” she said. “And don’t ask me what sort of things, because I’m not going to answer. But just stuff. May 18, 1994: Pop icon Michael Jackson and Singer Lisa Marie Presley in the Dominican Republic. The “King of Pop” and the daughter of “The King” wed in a secretive ceremony at the luxurious Casa de Campo resort. Lisa Marie Presley was engaged in 2000 to rocker John Oszajca. She broke off the engagement after meeting Nicolas Cage at a party. 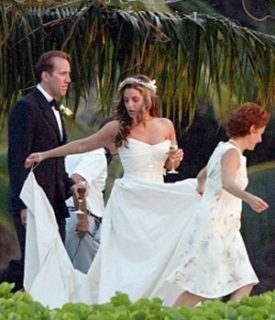 Lisa Marie wed Nicholas Cage, August 10, 2002, in Hawaii. They were divorced three months later. 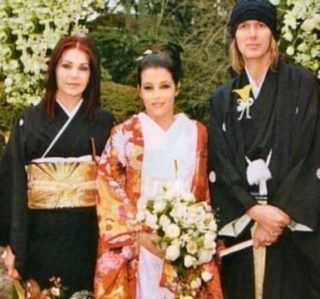 Lisa Marie was married for a fourth time on January 22, 2006, to Michael Lockwood. Danny Keough (first husband) served as best man at the couple’s wedding, held in Japan. Priscilla Presley and Lisa Marie’s two children were in attendance.